BOSTON, MA--(Marketwire - September 19, 2007) - While many companies have successfully gone overseas in search of lower labor costs, few have developed a comprehensive, global strategy to hiring and developing employees, concludes a report published by The Boston Consulting Group (BCG). 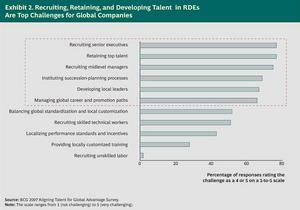 The report, "Aligning Talent for Global Advantage," is based on interviews and surveys with nearly 100 executives from such companies as Adidas, SAP, Schlumberger, Tata, Unilever, and Wipro. are less loyal to their employers than their parents were to their jobs. operating in those markets are numerous and complex (see exhibits at end). range from 15 to 30 percent. "Many companies have not adequately planned for the type and number of employees required to meet their global growth strategies," says Daniel Friedman, a Los Angeles-based partner who coauthored the report. "Optimizing talent management requires a complete shift in power and perspective, from a single-centered operating model to a multi-centered one." 20 percent of its executives based in India by 2010. --  Elevate global talent planning to an item on the CEO's agenda. part of the annual strategic-planning process. recruiting from the top-tier schools. identified about 2,000 high-potential employees from a pool of 30,000.
talent strategies and project talent needs into 2015. The report says that few -- if any -- companies have embraced all these principles, which suggests that companies still have time to recover if they have gotten off to a slow start. To receive a copy of "Aligning Talent for Global Advantage," or to schedule an interview with one of the authors -- Daniel Friedman, Jim Hemerling, and Jacqueline Chapman -- please contact Eric Gregoire at + 1 617-854-4570 or gregoire.eric@bcg.com. The Boston Consulting Group (BCG) is a global management consulting firm and the world's leading advisor on business strategy. We partner with clients in all sectors and regions to identify their highest-value opportunities, address their most critical challenges, and transform their businesses. Our customized approach combines deep insight into the dynamics of companies and markets with close collaboration at all levels of the client organization. This ensures that our clients achieve sustainable competitive advantage, build more capable organizations, and secure lasting results. Founded in 1963, BCG is a private company with 66 offices in 38 countries. For more information, please visit www.bcg.com.